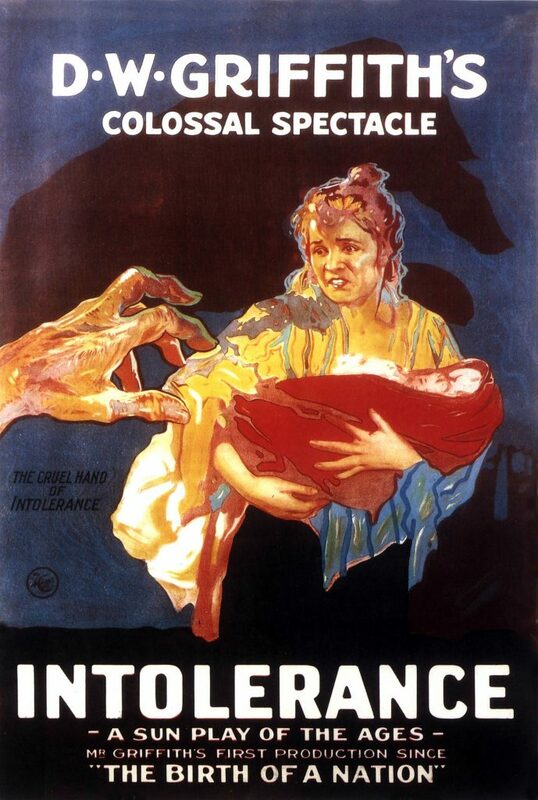 Intolerance is a 1916 epic silent film directed by D. W. Griffith. Subtitles include Love’s Struggle Throughout the Ages and A Sun-Play of the Ages. (4) a Babylonian story: the fall of the Babylonian Empire to Persia in 539 BC. Each story had its own distinctive color tint in the original print but in the current available versions that is not the case anymore. The scenes are linked by shots of a figure representing Eternal Motherhood, rocking a cradle. Intolerance was made partly in response to criticism of Griffith’s previous film, The Birth of a Nation (1915), which was criticized by the NAACP and other groups as perpetuating racial stereotypes and glorifying the Ku Klux Klan. It was not—as is commonly implied—an apology for the racism of his earlier film; in numerous interviews, Griffith made clear that the film’s title and overriding themes were meant as a response to those who he felt had been intolerant of him in condemning The Birth of a Nation. In the years following its release, Intolerance would strongly influence European film movements despite its lack of commercial success domestically. Intolerance was a colossal undertaking featuring monumental sets, lavish period costumes, and more than 3,000 extras. Griffith began shooting the film with the Modern Story (originally titled “The Mother and the Law”), whose planning predated the great commercial success of The Birth of a Nation, which had made $48 million, about $688 million in 2017. He then greatly expanded it to include the other three parallel stories under the theme of intolerance. Actual costs to produce Intolerance are unknown, but best estimates are close to $2.5 million (about $47 million in 2017), an astronomical sum in 1916. A third of the cost went into making the Babylonian segments of the film. The film was by far the most expensive one made up to that time. When it became a flop at the box-office, the burden was so great that in 1918 the Triangle Film Corporation had to be put up for sale. Griffith mostly financed the film, which contributed to his financial ruin for the rest of his life.